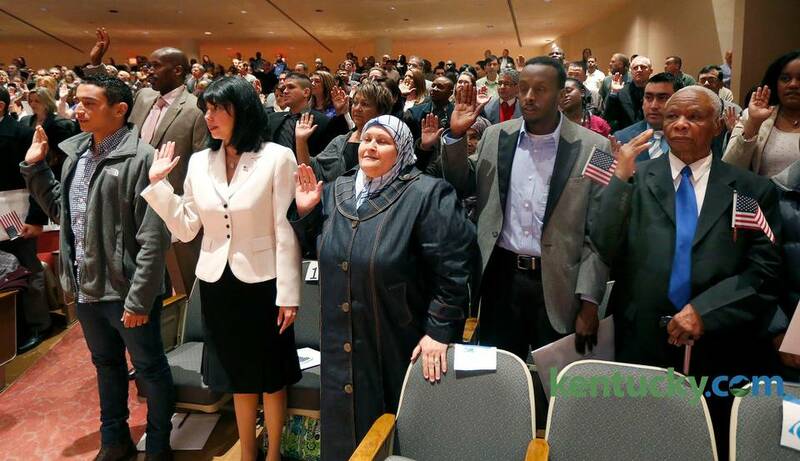 Naturalized U.S. citizens taking the Oath of Allegiance. We knew it was going to be this way: liberals are going to get indignant and obstructionist about any policy that President Trump tries to enact over the next four years, no matter how reasonable or unremarkable it may be in actuality. It will be a continual source of amusement to see what new alleged slights to human decency liberals will discover to get angry about in the years to come. The most notable example so far, of course, not even two weeks into Trump’s Presidency, is the uproar in response to his banning of entry into the U.S. of the citizens of seven Muslim-majority countries, and an accompanying ban of all refugees, for a period of ninety days. There are many ways to respond to the liberals’ accusations that this is an unprecedented act of barbarism in modern American history, as Aedon Cassiel ably did in his latest article. One could point to the fact that Obama used executive orders to ban entry to foreign nationals from specific countries on at least six occasions during his presidency. One could mention that the seven nations affected by Trump’s ban were all named in Obama’s own Visa Waiver Program Improvement and Terrorist Travel Prevention Act from 2015. One could show that Obama oversaw the deportation of nearly three million immigrants during his tenure, which is more than all previous American presidents in history combined. One could even mention, to those few liberals who might care, that no less a personage than Saint Thomas Aquinas recognized the absurdity of an open-borders policy. But the fact is that liberals are not going to listen to reason on this issue, or most likely on any other issue that Trump is championing, since they are not interested in the truth, but rather only in how they can weaponize this sense of injustice to use against him. This is clear when we look at the number of Democratic, and in some cases even Republican, politicians who have chosen to support the protesters over the past few days. I therefore think that it is wrong to fall into the mainstream Right’s mode of discourse regarding this issue (“See, you guys did it, too!”). Because, as much as I approve of what Trump has been doing so far, and in spite of the fact that I am in favor of anything that reduces immigration into the U.S., the truth is that Trump’s ban is not a real solution to America’s immigration problem. At best, it’s a fatal half-measure, as is the Wall along the Mexican border. The real question that no one is willing to ask in mainstream politics is, should America continue to be a home for those of European descent, and should it continue to be shaped primarily by European ideas and values? If we don’t refocus white Americans’ attention on this much more pressing issue, these minor battles that will crop up in the near future will at best slow the inexorable transformation of the country into a Brazilesque plantation by merely a degree, and at worst become a distraction from what is really at stake. The justification for the immigration ban is that it is a measure to protect Americans from terrorist threats. But as the liberal media has been correct to point out, very few terrorist attacks are carried out or attempted by recent arrivals to the U.S., and the one particularly notable exception – 9/11 – was carried out by citizens of countries not included in the ban (15 were from Saudi Arabia, and the rest were from Egypt, Lebanon, and the United Arab Emirates – all of which remain on friendly terms with the U.S.). Not to mention the fact that the ban does nothing about the citizens of those countries who are already present on American soil. So while it is statistically possible that Trump’s ban will prevent people from entering the country who intend to do harm, a myriad of potential threats still remain unaddressed. The Wall, on the other hand, has a much greater potential to do good. And it directly addresses a very real problem for white Americans: the fact that illegal immigrants are costing American workers many jobs. Nonetheless, even if it is successful in stopping every single wannabe illegal from entering, and even assuming that they don’t find some new route into the country, Trump has made it clear that he is all in favor of allowing legal immigration to continue unabated, nor is he likely to do anything about the ones who are already here. So while it is a definite move in the right direction, it alone is not going to solve America’s immigration problems. Trump has been hyping the ban and the Wall because they address the two fundamental concerns of a democratic populace: security and economics. And the majority of white Americans voted for him because, for the first time in several decades, they felt like he was a politician who was addressing their concerns, rather than those of an elite which seems to have the interests of everyone but them at heart. But Trump, whatever his actual beliefs on the matter may be, is still constrained by the structure and values of the system that he is working within, and that system simply isn’t designed to address their needs in a thorough and all-encompassing way. The real problem with immigration is not that it threatens Americans’ security or their economic well-being (although these are certainly part of it). The real problem goes back to the very principles on which America was founded, to the idea that “all men are created equal, that they are endowed by their Creator with certain unalienable Rights.” It was this sort of philosophy that led to the Fourteenth Amendment, and the idea that anyone who happened to be born on American soil, or who could pass a basic test on American civics and history, was just as much an American as someone whose ancestors had been living there since colonial times. After all, if everyone is born equal, why is a sixth-generation American any more entitled to the privileges that America has to offer than someone who just got there? As soon as the fledgling nation embraced these ideas, everything that has followed subsequently became inevitable. While there is no doubt in my mind that, had they somehow known that one day hordes of people from every corner of the globe would be knocking each other over in their desperation to reach America’s shores, the Founding Fathers and the drafters of the Citizenship Clause would have rethought their ideals, this is nevertheless the legacy that we have been stuck with. I know some readers will be thinking that until 1965, American law kept out most immigrants from everywhere except Europe and Latin America. While this is true, it is nevertheless the case that most Americans today are entirely conditioned to believe that America is fundamentally a “nation of immigrants” – meaning immigrants from anywhere – and that altering this state of affairs is tantamount to undoing America. And this brings us to the crux of the problem. While America is saturated with minority racial politics, identity politics for white Americans remains a taboo subject. Even Trump’s rhetoric could only be classified as being implicitly directed at whites. I believe that most white Americans acknowledge this on some level, and feel that it is something lacking, but still think, as a result of decades of conditioning, that it is wrong for them to articulate this, let alone act on it. So, if Trump continues to act in a way that is at least somewhat consistent with our principles, we can see him as a useful stopgap and potential gateway to something better. But those of us on the metapolitical New Right will have to keep pressing for an awakening to the need for a politics explicitly based upon ethnicity among whites. This is less of a problem in Europe, where most Europeans still have a consciousness of themselves as belonging to a particular people and tradition, but white Americans have been indoctrinated into believing that their identity is wrapped up in a rather bizarre abstract ideal rather than blood and kinship. Given that most people already have an affinity for those who are similar, this is certainly not an impossible task. But it will not be enough merely to revive their ethnic communal spirit. Just as importantly, white Americans will have to realize that the American conception of law and politics must be overturned at its most basic level. And this, I believe, will be much more difficult to achieve, given the deeply-ingrained attachment to American institutions and ideals that many of us have. But it is no less essential, if white Americans are to be regenerated as something more than the relics of a bygone age. This is why, in spite of the fact that we can hope that the Trump administration will take at least some of the heat off, we have to continue to try to build loyalty among white Americans toward each other, and to smaller communities, and decrease their identification with America as a state. It may be possible that one day America will change and become something that we can support wholeheartedly again, but that day has not yet come, and, at the risk of sounding pessimistic, may never come. Another hard pill that we will have to make white Americans swallow is to disassociate the idea of a successful nation from the pursuit of endless economic growth. Truthfully, if we are serious about ridding America of mass immigration, it will mean the end of the present state of affairs economically speaking, lest we forget the fact that mass immigration is the reserve army of capital. White Americans will have to resume doing jobs that they don’t necessarily enjoy doing or find worthy of them, and it may be that many goods and services will not come as cheaply as they do now. We may have to make do with less. But we have to weigh this against the price of continuing to grow more and more decadent while simultaneously being ethnically replaced. So long as material satisfaction and profit remain the gauge by which we measure societal success, it will be impossible for our civilization to steer its course in accordance with any genuine values, including the value of self-preservation as a people and culture. We have to remain clear about the fact that a genuine nation cannot be built on a proposition alone. White Americans are the envy of the world because of the cultures and ideas that we inherited from our European ancestors, and because of the particular attributes that we have as a civilization, which includes our racial and ethnic attributes, and which were further developed by our white American forefathers. America has to remain a part of this inheritance, or it will cease to be America. We should instead seek something akin to the ancient Greek concept of the citizen, where one’s citizenship was conditional upon one’s ancestry and culture, as well as on the duties that one performed for one’s fellow citizens. The most common assumption that liberals make about those of us who oppose immigration is that we must hate immigrants. While there is some friction that occurs naturally between groups that markedly differ from one another, that’s different from hate. So I don’t think this is really the case for most of us, and certainly not for me. I don’t love immigrants in general, because I don’t love (or hate) any abstract group of people, but I also recognize that some people of other civilizations, cultures, and ethnicities have something valuable to offer, and vice-versa. We of the true Right are the ones who genuinely care about diversity, since we reject the idea which underlies liberalism, namely that everyone is essentially the same and that we are all destined to unite into one, huge endless party and drink Coca-Cola together. Rather, we want differences to continue to flourish and interact in the world; we merely assert our own identity among those of others, and encourage others to assert theirs – in their own space, of course, rather than in ours. We reject the multicultural ideal, which proposes a universal identity for the nation, and eventually the world, derived from liberalism and shepherded in by the wizards of globalist capitalism. In the end, like every other people, we simply want a place that we can truly call home. And a nation that is built on the idea that it is a home for everyone will inevitably end up being a home for nobody, or at least not for anything that we could call human in the sense that we know today. So be happy about Trump, but always keep in mind that he represents only one marker along a very long road. 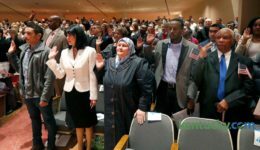 Published: February 1, 2017 | This entry was posted in North American New Right and tagged citizenship, democracy, Donald Trump, immigration, immigration ban, John Morgan, North American New Right, originals. Both comments and trackbacks are currently closed. One could show that Obama oversaw the deportation of nearly three million immigrants during his tenure, which is more than all previous American presidents in history combined. This persistent myth needs to die. The Obama administration manipulated the deportation statistics. Coincidentally the image you posted along with this article looked familiar to me, and I soon realized that it was only because it was taken at the “naturalization ceremony” my university has every so often. Believe me, this school is completely anti-Western, and things like that naturalization ceremony are only the tip of the iceberg. While violence is a concern, the prime reason we don’t want non-Whites and Muslims is because we have the right to have our own countries. They are coming to conquer. That they use passive means — moving in, demanding society adjust to them, and reproducing until they can vote themselves into power — does not matter, nor does it matter that they do not consciously intend these things. Their presence, whether they mean it or not, amounts to an invasion. White Genocide: is a crime, not a ‘policy option’. I wish this could be drilled into Trump’s conscience. Excellent comment, for a wonderful article!!! The fact is, the political system is collapsing, along with just about everything else. There is a psychological advantage in recognizing collapse when it happens, just as there is an advantage in realizing there is an abortive color revolution going on right now. Such an advantage that, if you thought the urine-soaked, disoriented, flailing of liberals was bad after the election, wait until the neo-cons, Soros and the Lügenpresse succeed in getting Trump to declare martial law, or succeed in convincing people he has done so.